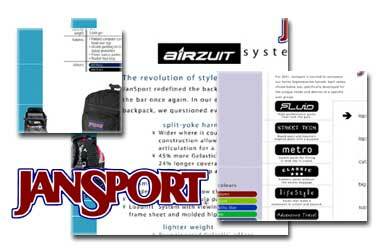 New Media Designs were approach by Qube Strategic Marketing to produce a CD-ROM for Jansport's UK branch. The goal of the project was to design a CD that could be used as a design resource for any marketing company wanting to use material relating to the Jansports brand on dual platform (PC & Apple Mac). As users of this product would need to access images and source material quickly, it was important that the result be easy to use as well as visually effective. The resulting design was produced using a combination of Macromedia Flash and DHTML resulting in a cross platform result meeting all of the design requirements. "It was refreshing to be listened to and advised and not dictated to... The site has been an unbelievable success and once again many thanks."